Hello everyone! We thought this month we would educate everyone on an important topic – feather and skin health! We’re starting off with out feathered friends, but will also touch on mammals and reptiles. What we can see on the outside of our exotic pets can certainly indicate how healthy they are, and we should regularly be monitoring for any abnormalities or changes. If you are ever concerned, book your pet in for an appointment today! Feathers are unique to birds and we think that makes them pretty special! They’re quite complicated structures that cover most of a bird’s body. Did you know that there are different types of feathers? For instance there are the soft down feathers which insulate the body, these aren’t normally visible as they lie close to the body under other feathers. Then there’s the flight and tail feathers which allow birds to fly. There’s also bristle feathers which are short protective feathers around the eyes, nostrils and beak. These often look like eyelashes and whiskers! Here is the beautiful Tiago showing us his colourful, healthy feathering! These feathers here are in suboptimal condition; you can see straight lines across the feather. These are called ‘stress bars’ and generally indicate a stressor (disease, nutritional issue, other) at the time of feather development and growth. Most pet birds will moult once or twice a year. This process involves losing and replacing all the feathers on the body over a period of time. It happens slowly enough that they can generally still fly. When new feathers grow they are covered by a sheath of keratin, we call these pin feathers. Birds spend a lot of time grooming when they are moulting, to remove this sheath from the new feathers. 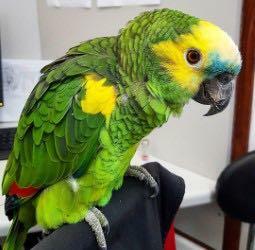 Sometimes they let a friend bird or owner help them with the pin feathers on their head. So how do you know if your bird’s feathers are healthy? Feathers should have a strong shaft and not be bent or broken. The feathers should be clean and shiny. In many Australian parrots such as cockatoos, galahs and cockatiels they should also be powdery. 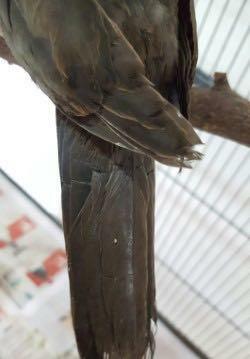 Stress bars are lines that run across the width of a feather and indicate that the bird was stressed, unwell or not receiving adequate nutrition while the feather was growing. These are most commonly seen on the tail feathers. To help your bird maintain healthy and beautiful feathers we recommend ensuring that you are feeding them the correct diet. This information can be found on our website. It’s also important that your bird has the opportunity to bathe. This might be in their water bowl, in the shower, under a tap or with a spray bottle. If you have any concerns about the health of your bird’s feathers then give us a call on 07 3217 3533.